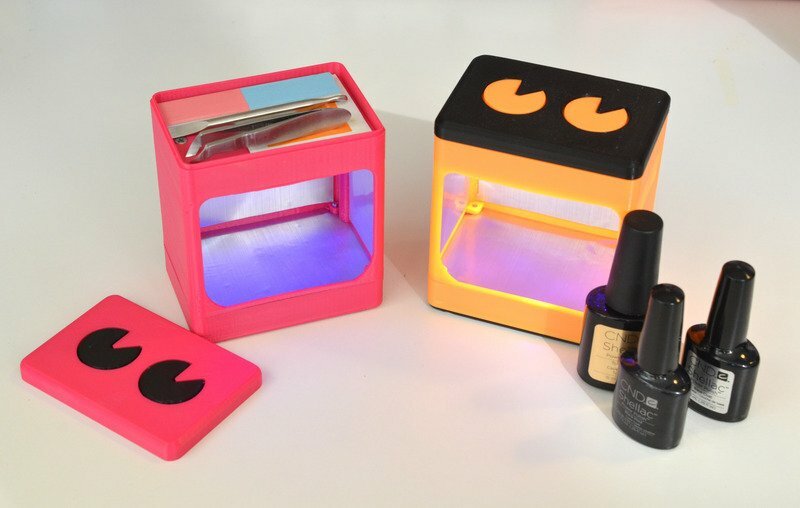 UV Manicure Lamp #WearableWednesday « Adafruit Industries – Makers, hackers, artists, designers and engineers! This week we’re doing manicures with DIY electronics. If you’ve seen my videos or photos before, you already know I like to paint my nails. What you might not know is that it’s UV gel nail polish– a different chemical formulation that’s more durable, flexible, and lasts much longer than the air-dry stuff. And it doesn’t just look nice, it lets you do more stuff with your nails– open cans, pick at electronics, do the dishes– I like to call it “structural” nail polish. Without it, my long and useful nails would split and break under the pressures of everyday makin’ stuff. But gel polish has to be cured in a UV lamp, which is something usually only nail salons have, or, like me, you buy one on Amazon and it takes up as much space as a large toaster oven and has to be plugged into the wall. Doing your own gel manicure is easy if you have the right tools, dare I say even easier than standard polish because the different viscosity smooths out its own inconsistencies and once it’s cured, it’s completely dry. Adafruit’s UV LEDs, PowerBoost 500c, and 2500mAh battery make it easy to whip up your own manicure lamp at home, and Noe even designed a 3D printed enclosure for putting it all together. Read the complete tutorial on the Adafruit Learning System to build your own!